In honor of Mental Health Awareness Month, Christian author and mental health counselor and Christian coach Heide R. Kuhlman has released her new book, “Living for the Fruit of the Spirit: Christianity for Those with Mental Health Conditions” which shares her personal story of struggling with mental health conditions as well as in her faith and relationship with God. Kuhlman’s book addresses the struggle that many Christians who suffer from mental health conditions have in relation to their faith who may be feeling angry, guilty, sad, alone and helpless and to reaffirm that they are not alone, and God is indeed there for them. The book also encourages those with mental health conditions as well as their loved ones, to understand, appreciate and respect the role and responsibility God has played in their lives. “Living for the Fruit of the Spirit” presents an honest look at Kuhlman’s 15-year struggle with bipolar, borderline, ADHD and postpartum depression along with her relationship with God as well as her testimony and the many tools that helped her through some very challenging times in life. As those who suffer from mental health conditions often struggle with Christianity due to having a difficult time recognizing what role God has in their lives, Kuhlman demonstrates how God uses both the condition and those who suffer from the symptoms for his glory. She explains how it is possible for Christians to still live by the characteristics and power of love, joy, peace, patience, kindness, goodness, faithfulness, gentleness and self-control – or by the Fruit of the Spirit. 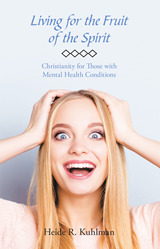 With May being Mental Health Awareness Month, Kuhlman’s book is a must read for Christians suffering from mental health conditions and for the people in their support system, as she demonstrates how they can still live by the fruit of the spirit as well as lead a reasonable, realistic and healthy life. To learn more, please visit http://www.fruitofthespiritheiderkuhlman.com. Kuhlman’s book is also available at the “Blessings Big & Small” Christian Store in the Watertown, South Dakota mall. Heide R. Kuhlman has past professional experience in the mental health field along with her own 15-year struggle with bipolar disorder, borderline, ADHD, and postpartum depression. For 10 years, Kuhlman had a private practice in mental health and family counseling where she was a licensed marriage and family therapist-mental health (LPC-MH). She is a past member of the American Association of Marriage and Family Therapy (AAMFT) and of the American Psychological association (APA). She received a master’s degree in mental health counseling with an emphasis in marriage and family therapy, a bachelor’s degree in psychology, and is currently pursuing a master’s degree in divinity through Liberty University. Kuhlman and her husband are the parents to four children and have owned and operated the Blessings Big & Small Christian Store for five years in Watertown, South Dakota where she currently lives.